If I had to pick one recipe that my future grandkids would beg me to make it would be these cookies. Everyone needs a family favorite and these are it. Chocolate chip cookies recipes are as unique as the person baking them. These are a perfect combination of crispy, soft, and chewy. My husband *loves* them. The school principal *loves* them too. I have baked up several batches for my husband’s business meetings and several more batches for the school bake sale, PTA meetings, and parent/teacher conferences. These are my go to CCC. Well not this recipe exactly. This recipe I made even better than my go to by adding M&M’s. M&M’s make everything better, amirite? In the past I used to add a box of vanilla pudding to my cookie recipe. It made them soft and chewy. Awhile back I saw the blogs all a buzz about adding cornstarch to the cookie dough. Brilliant! I couldn’t believe I didn’t think of it myself. There is cornstarch in instant pudding mix. By adding only cornstarch to my dough I could skip all the other stuff that is in instant boxed pudding mixes and have all the benefits. I decided I would give it a go. 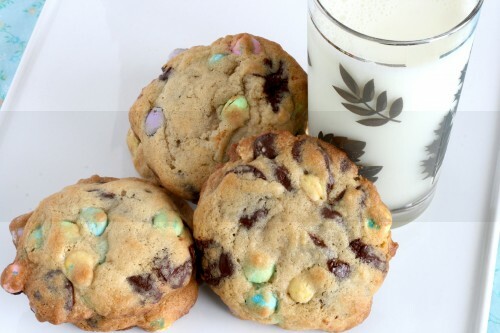 I picked up some Easter M&M’s with the intention of making monster cookies but they wereÂ destinedÂ to jazz up my favorite chocolate chip cookies. Bake some up to share with your coworkers this week, or to enjoy while watching basketball (I heard there was some sort ofÂ tournament), or bring a batch or two to your Easter celebration. I also like to mix these up ahead of time and freeze them. Using my ice cream scooper I scoop up balls of cookie dough and place on a parchment lined cookie sheet. Pop in the freezer for 8 hours or over night. Place the frozen cookie dough balls in a freezer bag and store until the craving strikes. While oven is preheating place cookie dough on a parchment or silpat lined cookie sheet. Bake for about 15 minutes. The texture of the cookies changes slightly baked this way. They are a little puffier and denser. I still get rave reviews when I make them this way too. In a mixing bowl cream together butter, brown sugar, and white sugar. Add eggs one at a time. Scrape down bowl as needed. Mix in vanilla. Slowly add in flour, cornstarch, soda, and salt. Mix until just combined. 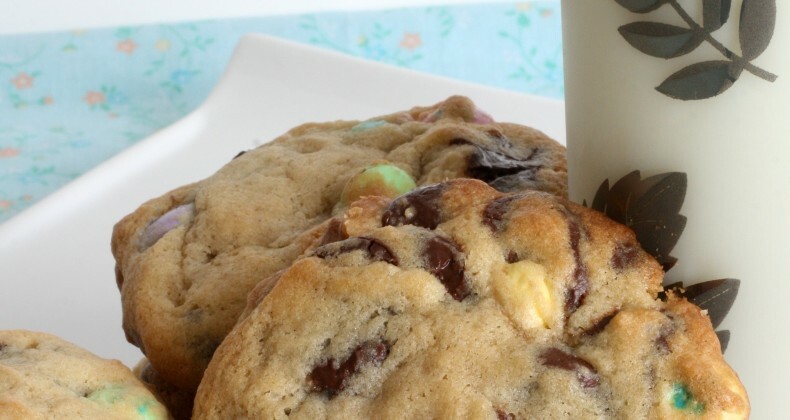 With a wooden spoon mix in baking chips and M&M's. Bake on a parchment or silpat lined cookie sheet. I like my cookies big so I use an ice cream scoop to have uniform size. Bake for 10-13 minutes. Cool on the pan for 2-3 minutes before transferring to a cool rack. oh my goodness- I have to try adding some cornstarch to my cookies next time!! I’ll probably be remembered for my Avocado Pine Nut Salad. I bring that salad with me to every event, and my family loves it too!